South Korea says North Korea fired a short-range missile off its east coast late Tuesday near the North Korean port city of Wonsan. South Korea's Joint Chiefs of Staff said the missile flew about 200 kilometers before hitting a target on land. The missile launch is the latest reaction by North Korea to new international economic restrictions and to joint U.S.-South Korean military operations. 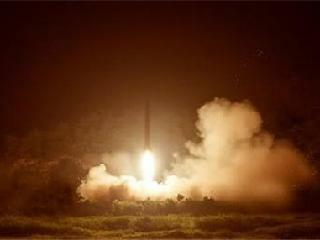 On March 21, North Korea fired five short-range missiles into the East Sea from the eastern city of Hamhung. The week before, it fired medium-range missiles into the sea. Those launches came after the United Nations placed sanctions on North Korea after its fourth nuclear test, which took place in January. A month later, North Korea tested a long-range rocket. North Korea has been threatening for weeks to launch nuclear strikes against Washington and Seoul to protest the joint military operations. The country says it believes they are preparing a military invasion. A Japanese media report says North Korea has fired a short-range missile toward the Sea of Japan. The ruins of their homes and favorite spots are scattered throughout the busy port city. North Korea says the United Nation's sanctions over its nuclear test amount to "a declaration of war". 1.Those launches came after the United Nations placed sanctions on North Korea after its fourth nuclear test, which took place in January. My object is to be of use to those that come after me. He will come after you. 2.The country says it believes they are preparing a military invasion. Rome's military invasion of Great Britain, Scottish pipers introduced. Faced with the threat of a full- scale military invasion, the general has no choice but to cooperate.